Our arts are a reflection of our way of life and keep our cultural traditions alive. Each item is one of a kind, authentic, and hand made; crafted by Native Athabascans in remote villages of the Alaskan interior. 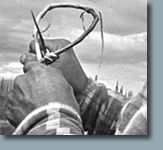 We use moose skin, caribou skin and hair, moose bone, birch wood and other natural material. Our life is based upon the seasons; each season brings new activities and new gifts from the land. Our artists have learned their skills from their elder generations. Here are our featured artists.